The teeth are hard calcified structures that play a role in eating, speech and communication. Each tooth is made up of three layers: an innermost layer of pulp, which contains blood vessels, nerves and pulp cells; dentin, a calcified layer that contributes to the structure and security of the tooth; and enamel, a very hard substance that protects the tooth. A tooth abscess stems from tooth infection and can be a serious and life-threatening disorder. A number of stages exist in the development and progression of a tooth abscess. The initial stage that leads to tooth abscess is the development of tooth decay. Tooth decay develops when the tooth surface is repeatedly exposed to sugar and acid. Bacteria colonize on the tooth and generate plaque, which eats away at the tooth enamel, forming a cavity. Once the bacteria have colonized the cavity, they continue to secrete acid products that eat through the tooth, moving into the dentin layer. Once the decay reaches the softer dentin, the rate of tooth decay speeds up and runs through the interior of the tooth. The initiation of a tooth abscess begins when bacteria eat through the dentin and enter the pulp. 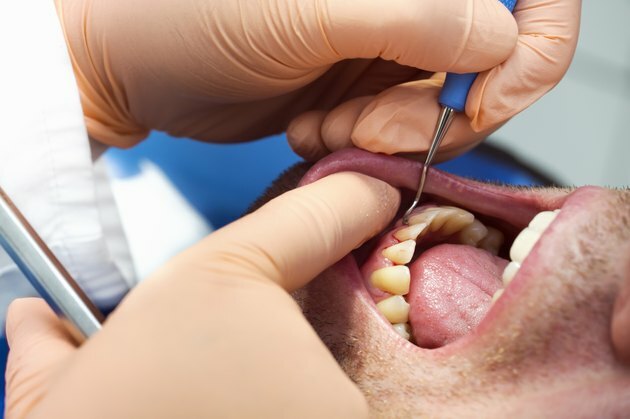 At this stage of the abscess, the decay can be treated with a root canal, reports the Ohio State Medical Center. Once the decay allows bacteria to enter the tooth pulp, the pulp becomes inflamed and infected, and the nerve begins to die. Nerve irritation and injury can cause a toothache, and patients with a dying tooth nerve may experience sensitivity to cold or sugar. The immune system also attacks the infection and causes more inflammation. The result of the immune system attack is the development of pus--white liquid made up of dead cells, white blood cells and bacteria. The pus builds up around the dying root, placing pressure on surrounding structures and causing abscess, pain and swelling. Some teeth at this stage of decay may be treated with root canal therapy, while other cases may require tooth extraction. The later stages of tooth abscess involve the spread of the infection from the root of the tooth to neighboring structures. The infection can spread to the alveolar bone, the bone that supports and holds the tooth. The abscess can eat away at the bone tissue, leading to bone loss and a loosening of the affected tooth. If bone loss around the tooth is significant, the infected tooth must be extracted. If left untreated, the late stages of tooth abscess can develop into potentially fatal infection. The infection can spread along the jaw bone and into the brain, which can prove fatal, reports Howard University.